For sale in our St. Louis showroom is a 1967 Ford Fairlane GT. This beautiful, fully restored Ford is a true GT that both looks and sounds amazing. Under the hood lies a 390 CID V8 big block engine and a 4-spd manual transmission. The GT/GTA 390 CID engine developed 335 bhp (250 kW) with higher compression, and had a four-barrel carburetor. Backing this is a 9" rear-end with 3.55 posi gears. All of which has just 500 miles since rebuild. The exterior is painted Merlot red with Beige accents inside the car. The interior also has tan leather, new door panels, carpet, and headliner. Options include: AM radio, power brakes, power steering, seat belts, leather interior, radial tires and rally wheels. The 390 engine has been bored .030 over with an Edelbrock camshaft, aluminum intake, and a 650 CFM carburetor. Up front are completely rebuilt disc brakes and drum on the rear. Other new components include: clutch, suspension bushings, ball joints, pressure plate, throw out bearing, interior, steering wheel, door handles, mirrors, gas tank, wheels, tires, fuel lines, sound deadening kit, trunk mat and taillight bezels. The restoration was just recently finished and is ready to be enjoyed. 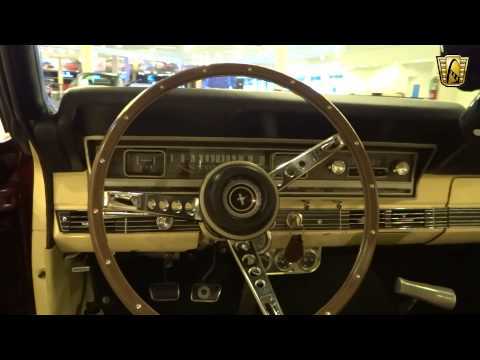 To view this listing in greater detail, including a video of the Fairlane running and driving, please visit www.gatewayclassiccars.com or our St. Louis showroom. For more information please call 618-271-3000.